A study published in the Proceedings of the National Academy of Sciences found that being hungry can cause extreme mood swings and less impulse control in many people. 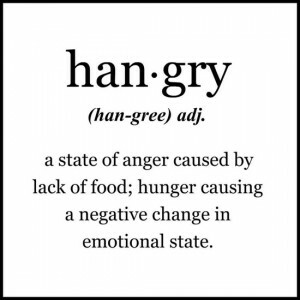 The study found that spouses are more likely to have arguments and marital dissatisfaction when they are feeling hangry—a term for the angry feeling that comes on when someone is feeling hungry. “Hungry people are cranky people,” says the lead author Brad Bushman, Ph.D. “When you’re hungry, your body goes into a fight-or-flight response to help you hunt for food,” he says. “It becomes a vicious cycle: The adrenaline mobilizes the body’s sugar to fuel your search for food, but eventually you feel very depleted and get hungry. Then the whole cycle starts all over again.” This doesn’t just fix itself once you satisfy your grumbling tummy. The cycle often continues, or people reach for the wrong foods. Often the first thing people want to do when they’re feeling depleted is to eat something sweet. Your serotonin is also running low which makes that cookie look more attractive than ever. However, the sugar will cause an insulin spike quickly followed crash, which will leave you feeling frustrated and moody. Eat every 3-4 hours. Avoid the blood sugar roller coaster by getting a protein, carb and fat every 3-4 hours. This means a KIND Bar, cheese and crackers, fruit and nut butter all would be great snacks. Purchase a jar of unrefined organic coconut oil. Take a spoonful upon waking, before bed, and when you get home from work or mid day. It stabilizes blood sugar. Always have a baggie of nuts and seeds on hand; eat 1-3 nuts every few hours. Eat fatty foods at regular intervals. Don’t wait until you get hungry. Anticipate and prevent yourself from getting hungry in the first place with planning ahead. Avoid binges. If you are hungry, eat. If you are starving, don’t overeat. Portion control will help you from stuffing your face straight into a food coma, which will disrupt your blood sugar and mood.